Been awhile since I’ve put something up on the blog, been busy getting orders finished before my trip down to South Africa to visit my girlfriend. Long distance relationships can be tough, but IMO, she’s totally worth the effort! She’s supportive of my business, even though it’s still very much in the “getting roughed out” stage of the process. So please note that if you would like to place an order, I will not be back in the shop until Nov 10th, but I am still able to be reached via email(see the contact page) or via my social media channels(Facebook and Instagram). Now, onto the meat of this post! I’m a day late, my sincerest apologies, just being a bit behind schedule with packing, making sure I have power block adapters so I can charge my necessary devices, etc, not to mention finishing up my prototype for the upcoming formal announcement of tripod cases(spoiler alert! ), this post was supposed to go up yesterday, but it is first order of the day today, since I’m flying tomorrow night, and need to get stuff done done done! So, lens wraps. I’ve been offering them since day one, but I’ve decided to go back to the drawing board somewhat and make some modifications. No, not because I “need to”, my customers have been very satisfied by what I’ve offered, but as a artisan of sorts, and since I consider myself a tinkerer of sorts, I wanted to make some adjustments. So, I’ve done such, and after using them personally for a few weeks to see what could possibly be improved, I’ve found myself perfectly happy with the design as it sits now, and I believe you will be too! Up until this turning point, I’ve been using a 600 denier polyester or 500 denier nylon for the outside layer of my wraps. This works great, but it can be a little heavy weight-wise. Well, “What’s a few ounces, it’s a lens wrap” you might say? Well, ounces add up(rather quickly) to make pounds, and who wants to carry more than they need to? I know I don’t, and I’m a 6’5” big burly dude. No wilted flower of a man here, but still, I wanted to lighten them up a bit, without compromising functionality or protection offered. And less weight(even a little bit) helps keep the body from getting tired and worn out faster. So looking at readily available/sourced materials that would not cause a price jump(for me or for you). Assessing properties offered by said materials, but also what is required for the intended purpose, I chose to use what is normally considered a liner fabric: a 420 denier nylon, with the interior a 210 denier nylon, slightly softer and smoother. In terms of colors, there are a LOT of options. Looking at past sales on lens wraps and colors most commonly ordered, I’ve chosen to offer the most popular choices as a start(including a new one, the tan). 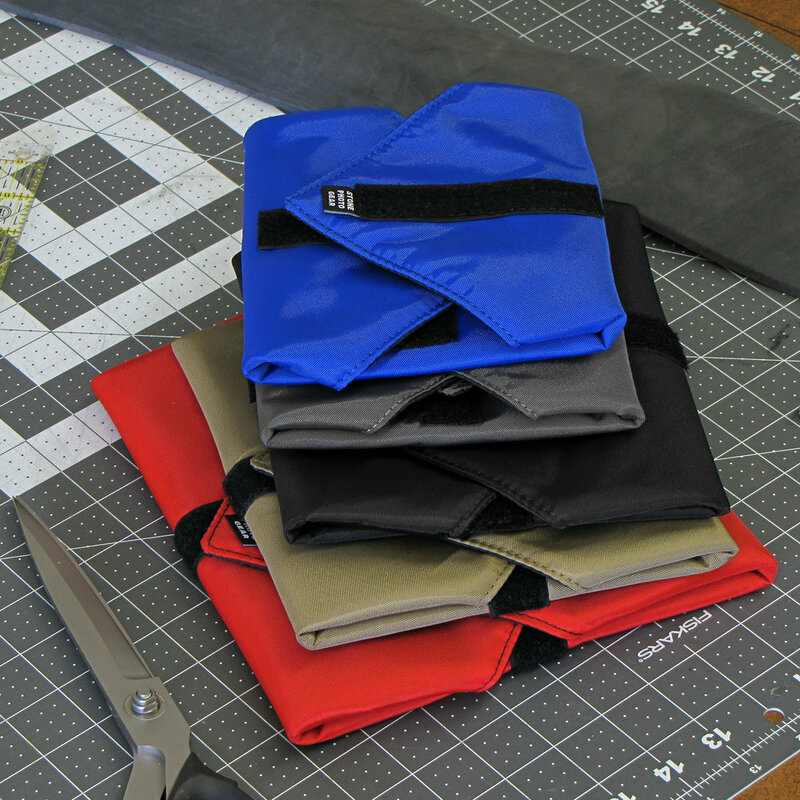 Black, Red, Blue(similar to the Mariner Cordura used for my film holder sleeves), Tan, and Grey. More colors might be offered down the line, this is simply a starting point. Special request can most certainly be submitted, if you have your heart set on a particular color. Looking forward to building you some gear in the near future! With Christmas right around the corner, a lens wrap or two can make a terrific stocking stuffer or last minute gift, just a thought! So if you are a photographer, videographer, or know someone who is, a padded wrap can offer a layer of protection to your precious gear. FYI, lens wraps don’t just offer protection for lenses. 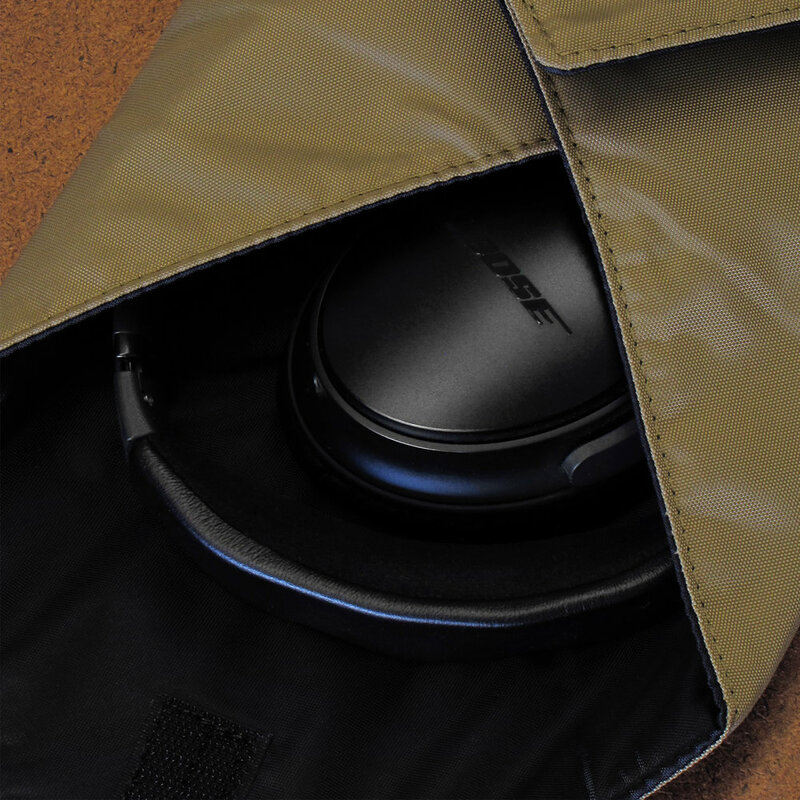 I’ve found that using one for my Bose headphones works better than the rigid case they originally came with. Feel free to ask any questions you might have, please use the contact page or feel free to comment here on this blog post.